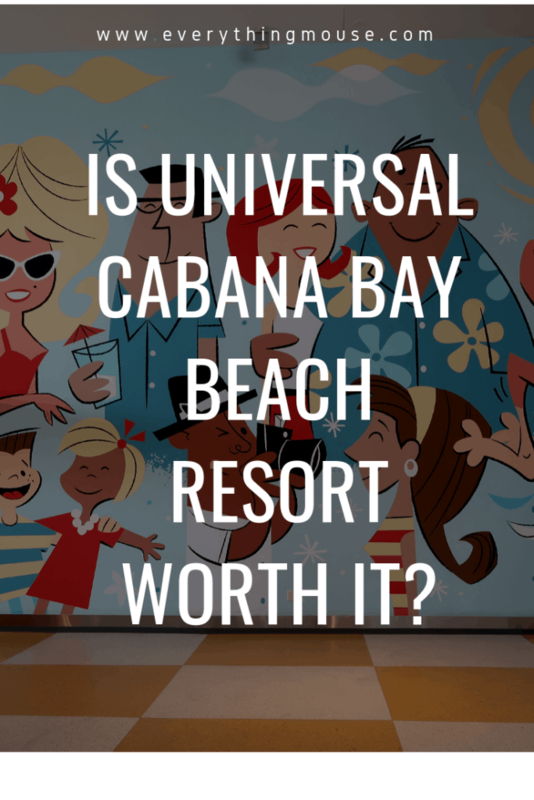 Are you thinking of staying at Universal Cabana Bay Beach Resort? 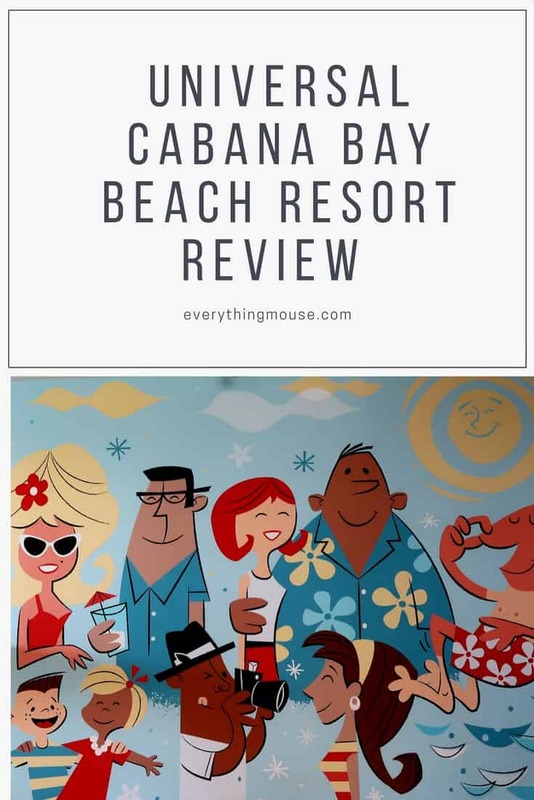 We have been lucky enough to stay here a number of times and Cabana Bay Beach Resort is one of our favorite hotels in Orlando. 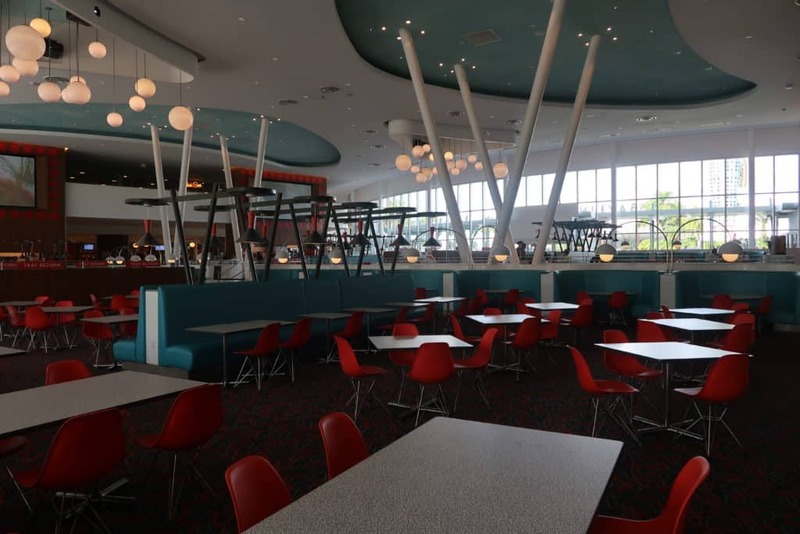 Universal Cabana Bay Beach Resort has a really fun retro 50s and 60s theme. 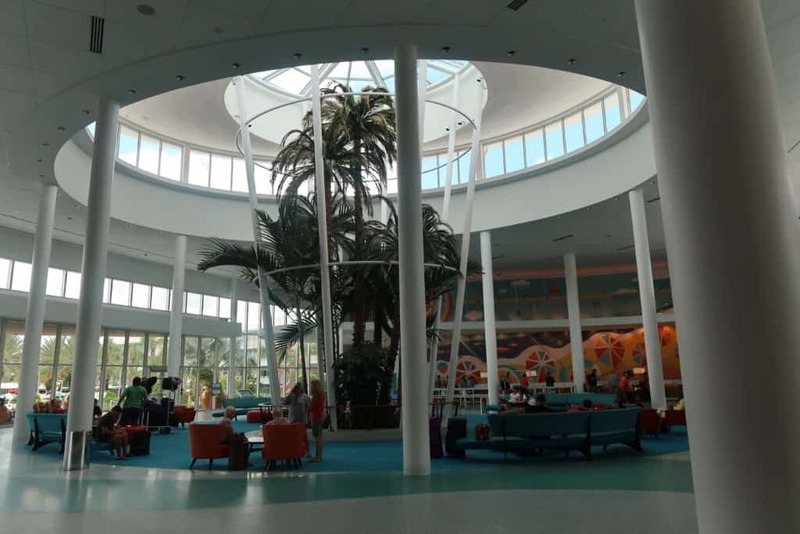 If you ever wanted to go back to nostalgic Americana you are going to love Cabana Bay Beach Resort. 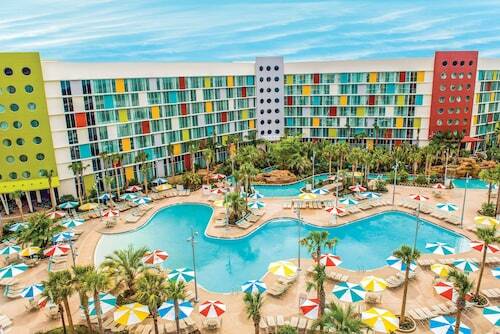 Universal Cabana Bay Beach Resort is perfect for a Universal Orlando theme parks vacation. There are few hotels where you arrive as a grown up and are just really excited by the theme. Cabana Bay Beach Resort puts a smile on your face from the moment that you arrive in the lobby. The theme is upbeat, fun and really well done. We think Cabana Bay is an excellent choice for those who want great features, value for money and a fun theme. It is a particularly good choice for families as the majority of the rooms are Family Suites which sleep up to six guests. You really can’t get a much better location than Cabana Bay Resort if you are visiting Universal Studios Florida and Islands of Adventure. Cabana Bay is part of the growing family of Universal Studios Resort Hotels. The other options are Lowes Portofino Bay Hotel, The Hard Rock Hotel, Loews Royal Pacific Resort and Lowes Sapphire Falls Resort. 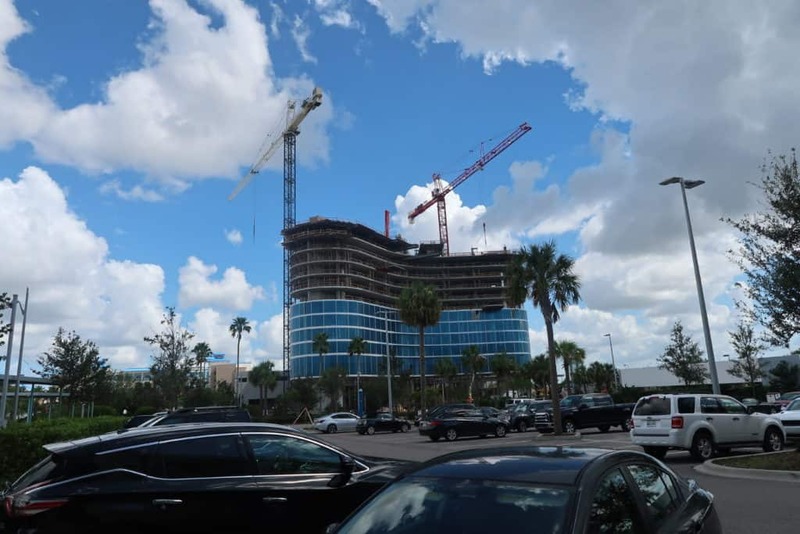 Universal Resort added a fifth hotel in August 2018 with Universal’s Aventura Hotel. You can walk to Universal Studios and Islands of Adventure from Cabana Bay Beach Resort. However, we really wouldn’t recommend doing that when it is so easy to get on board the shuttle bus. The shuttle buses travel at regular intervals from the front of Cabana Bay Resort. It is rare that we ever experienced more than a 5 minute wait for a bus. The actual journey from the hotel to the parks takes about 8 minutes by the Cabana Bay Beach Resort shuttle. It’s easy and the buses are clean and the drivers are helpful and cheerful. We never had to wait long for a Cabana Bay Beach Resort shuttle either to the parks or to Volcano Bay. If you walked from Universal Cabana Bay it is going to take at least 25 minutes to reach the entrance to Universal Studios Orlando or Islands of Adventure. 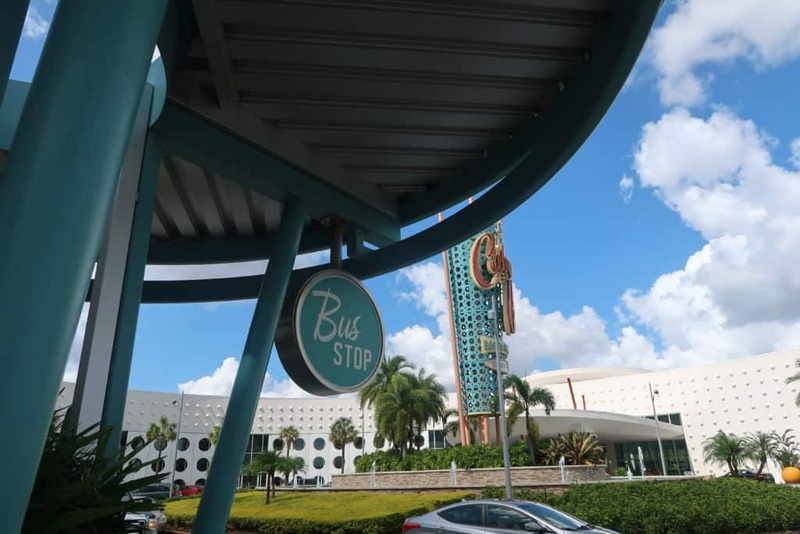 It can also get pretty hot in Orlando and we have to confess that we would rather take the Cabana Bay shuttle bus.We suggest that you save your time and perhaps more importantly your energy for the parks! The Cabana Bay shuttle bus stop is close to the main entrance to the security check point at Universal Orlando Resort. It is a short journey up the escalator and through the security lines. You then walk over the bridge. Turn left to Islands of Adventure or right to Universal Studios park. Cabana Bay Beach Resort is ideally placed to visit the new Volcano Bay Water Park. There is an entrance at the back of the property. So no need for a shuttle bus. Volcano Bay is a short walk from any of the rooms in Cabana Bay. We find this a particularly convenient feature of Cabana Bay Beach Resort. It really doesn’t get any better than this. You have to get a shuttle bus to Volcano Bay from the more expensive Portofino Bay, Hard Rock and Royal Pacific Hotels. It’s not too far on the shuttle, but it is a great feature just to be able to walk to Volcano Bay from Cabana Bay Beach Resort. 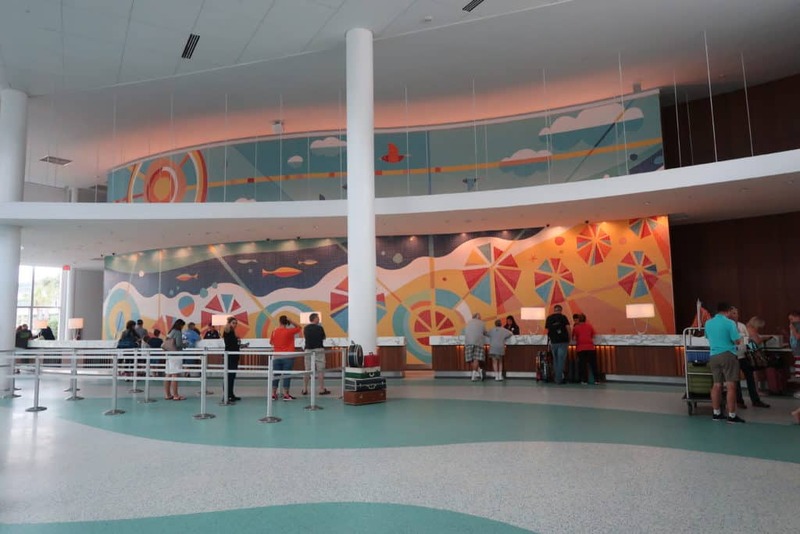 Apart from the location there are a number of additional perks which are only given to Universal Cabana Bay Resort guests. The most valuable of these perks is being able to enter the Wizarding World of Harry Potter and Universal’s Volcano Bay Water Park an hour earlier than the general public. This can make a huge difference to your Universal theme park visit. Even though the Wizarding World of Harry Potter has been open for a while now, it is still the busiest area of the Universal parks. The main Harry Potter rides of Escape from Gringotts and The Forbidden Journey are still the most popular rides in the park. At peak times the wait times can approach 120 minutes. If you have early entry you should be able to time it so that you can ride one of the main Wizarding World attractions at least twice. It is possible to go around three times but that is pushing it a little! The more expensive Universal Studios hotels, the Portofino, Hard Rock and Royal Pacific all have the extra, incredibly valuable perk of a free Express Pass for everyone staying at those hotels. Unfortunately Cabana Bay doesn’t offer this. Lowes Sapphire Falls doesn’t and neither does Aventura when it opens. However, we think that this is the only disadvantage to choosing Universal Cabana Bay over the other hotels. The Express Pass is a huge perk, but of course the hotels offering it are considerably more expensive than Cabana Bay and Sapphire Falls. It really depends upon your budget and how important the Express Pass is to you. If you are going at a slow time then Express Pass is nice, but no where near as much of a perk as if you are going at a peak time. The other perk is that you can charge everything to your room. All restaurant and merchandise purchases at Universal Resorts can be charged on your room key. We are not sure how much of a perk this actually is. One large account instead of splitting it between credit cards? Not really a reason to stay at a Universal Studios Resort Hotel. However, if you have the perk it is easy to use. It’s a nice feature that you can also have purchases delivered to your room. This means that if you buy all the Harry Potter merchandise that you have had your eye on you can have it delivered to your room. However,you do sometimes have to wait until the next day for it to arrive. Not an amazing perk, but nice to have. This is a major benefit of staying at Cabana Bay Resort. The rooms. They are some of the best designed rooms I have ever stayed in with family comfort in mind. We all know that cramming four people into an hotel room can be a challenge. Not at Cabana Cay Resort. The Family Suites really are perfect for parents with children. The Family Suites sleep up to 6 guests. They offer a very generous and well planned 430 square feet of space. The bedrooms in the Cabana Bay Family Suites have 2 Queen Beds. The bathroom is a split bath with the toilet on one side, a sink in the middle and with the bathroom to the right having a bath with shower and a sink. 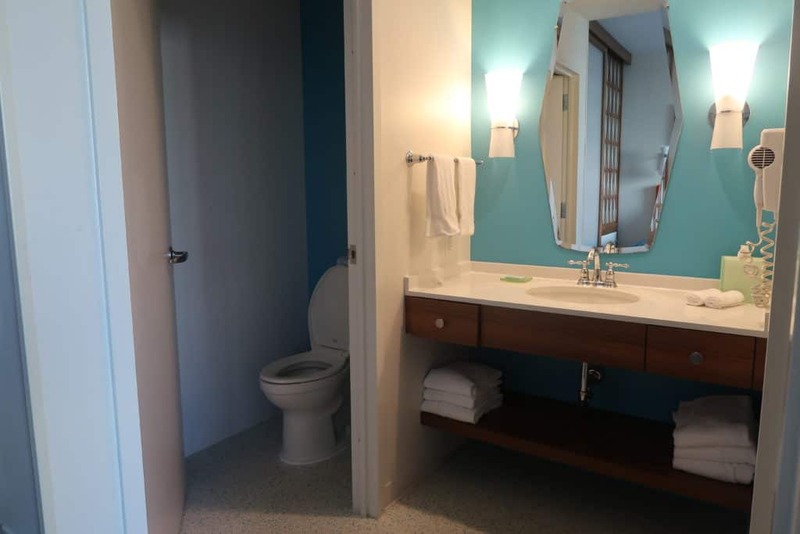 This really is the ideal set up for a bathroom for a family. Several people can get ready in the morning at once. This is really important when you are trying to get different members of the family out to the Universal parks early in the morning! There is also a separate living room, kitchenette area. The living room has a full sleeper sofa. It is comfortable enough for two children to share. An adult probably isn’t going to want to spend many nights sleeping on there, but it is pretty comfortable for a sleeper sofa. 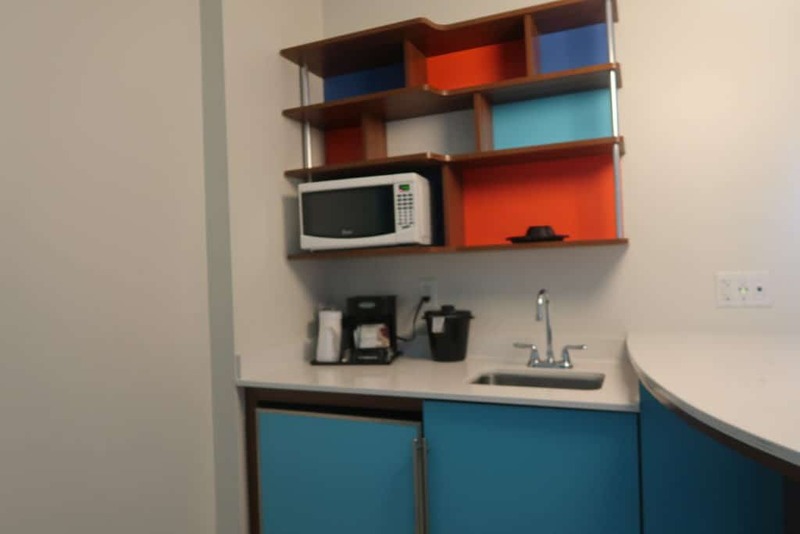 The kitchenette area has a microwave,small sink, decent sized but small refrigerator, coffee maker and a bar with seating. You can certainly save yourself some money if you are efficient about getting some breakfast items and snacks. The bedroom and living area are completely separated in the Cabana Bay Family Suites. It has a really good sliding door so that you can have privacy between the two areas. There is also a really useful closet area in the bedroom. It offers a good amount of space for putting your luggage and hanging clothes. It also has a safe. Both the living room and the bedroom have 48″ televisions. There is enough separation between the two areas that you can use both televisions at the same time if you really want to. 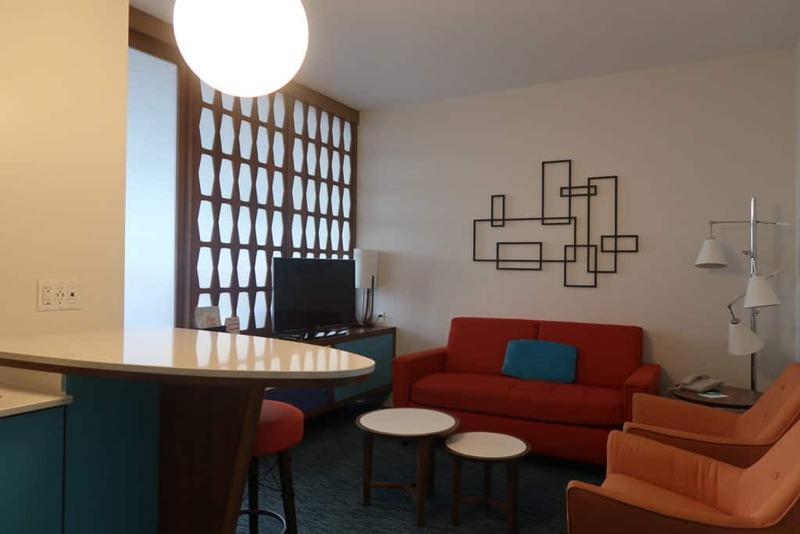 Universal Cabana Bay Family Suites are also available with connecting suites. If you have a really large party these are ideal. If you book a Family Suite at Cabana Bay Beach Resort you will choose between a Tower Suite and a Courtyard Suite. The Tower Suites have internal hallways and the Courtyard Suites have external hallways. We always book the Tower Suites even though they are usually at least $10 a night more. Just not a fan of external hallways. If you need extra space at Universal Orland Cabana Bay you can book a two bedroom suite. These are ideal for larger families or even two families sharing. The two bedroom suites offer up to 772 square feet of space and sleep up to 8 people. 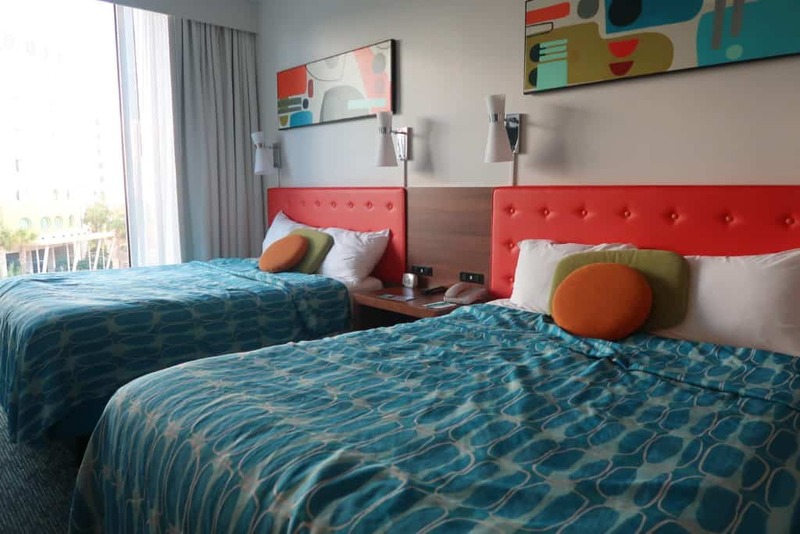 The two bedroom Cabana Bay Suites have 2 separate bedrooms. One has two full beds and the other has a Queen bed. The 2 bed suites also have a pull out full sofa in the living area. There is a kitchenette and 2 full bathrooms. 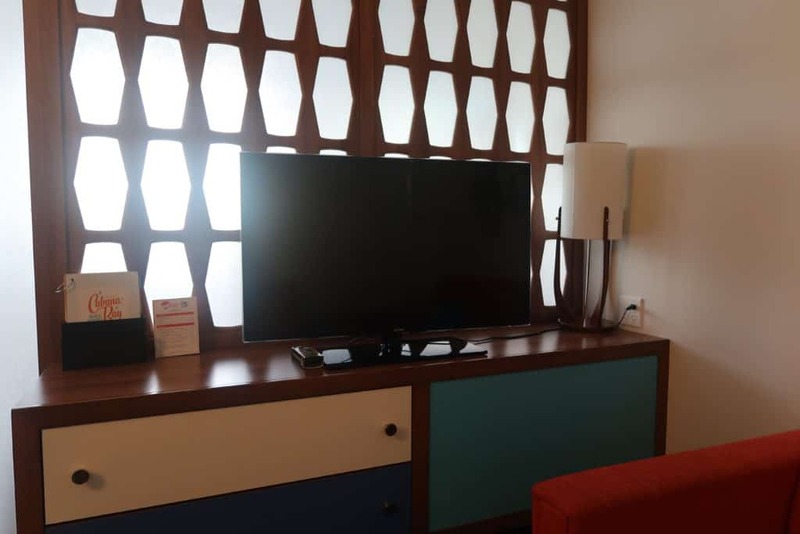 It is really difficult finding affordably priced larger accommodation close to Universal Studios, so if this is what you need you should definitely look at this option in Cabana Bay Resort Hotel. You can also book a room for 4 at Universal Cabana Bay. These are the perfect solution if you want a standard hotel room for up to 4 guests. The room has two Queen beds and sleeps up to 4 guests. The standard Cabana Bay Resort Hotel rooms also have a mini refrigerator and a full bathroom. At 300 square feet the standard rooms at Cabana Bay offer a decent amount of space. Cabana Bay Beach Resort has two main pools. The Cabana Bay Courtyard Pool is the largest of the two. Yo can access this straight off the lobby and it has a dive tower themed water slide. We really didn’t enjoy the water slide as the turns were really sharp and meant that you kept hitting the sides. In contrast to this the pool slide at the Universal Portofino Resort was one of the best hotel resort pool slides that we have ever encountered. 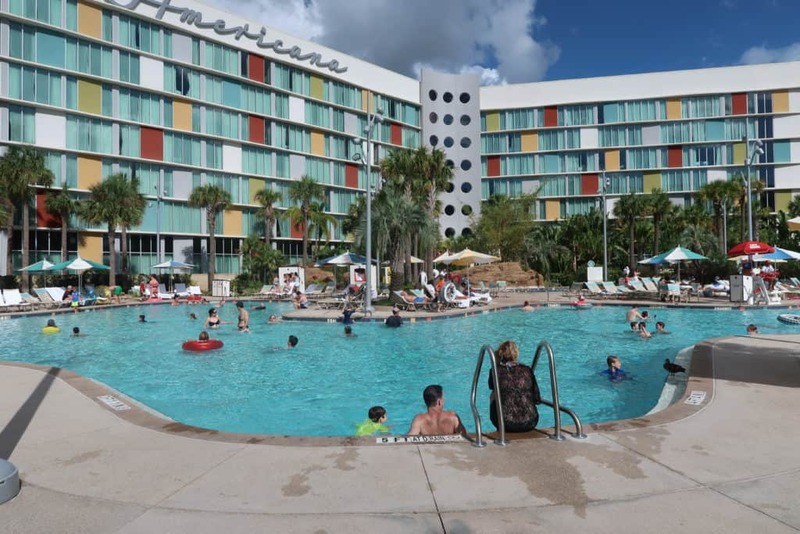 The Universal Cabana Bay Lazy River Pool is definitely our favorite and we talk more about that below. We much prefer that pool to the Courtyard Pool. The Cabana Bay Beach Resort pool hours vary according to the season. Check with the lobby so that you can find out the current Cabana Bay Beach Resort pool hours. You can rent a Cabana at Cabana Bay Resort. We have never done this and feel that we probably never would. You can just walk to Volcano Bay from Cabana Bay so if we were going to spend money on a cabana rental it would really be at Volcano Bay. However, Cabana Bay Hotel cabanas are available. Prices vary by the season but they are suitable for up to 4 guests. The Cabana Bay Beach Resort Lazy River is one of the best features of the resort for us. It is a reasonable size for a resort and usually it isn’t too crowded. It is a rare feature of any hotel resort to find a lazy river. It is the only one available at any Universal Orland Hotel Resort right now. It takes about 5 minutes to go the whole circuit and there are two main entry points. However, we do have one major complaint about the Universal Cabana Bay Lay River. To get an inner tube you have to pay! We never felt nickel and dimed in any Universal Resort, but to have to actually buy an inner tube for the Cabana Bay Lazy River is annoying. To get a decent sized inner tube is $11. Let’s do the math. Yes you can tell we are pretty put out by this. $22 for 2 kids. You can take them home with you. It’s pretty cool to have a Universal Cabana Bay lazy river themed inner tube or two at your home, but we really could have spent the $22 elsewhere. This really is our only complaint about Cabana Bay. Just give us a free inner tube! You can bring your own Cabana Bay Beach Resort Lazy River inner tubes, but who is really going to do that? We now own two but the chances of us remembering to back them next time we go to Universal Cabana Bay is probably almost zero! 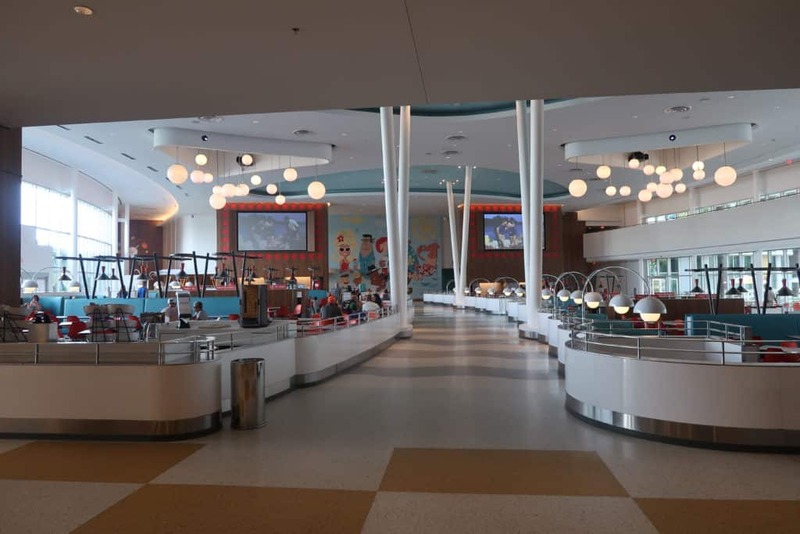 The Cabana Bay Bayliner Diner is a great place to grab something to eat. The Bayliner Diner is a large, fun, quick service dining location. There are plenty of different choices for breakfast, lunch and dinner. There are four different hot food stations to choose from as well as a salad bar, frozen yogurt self serve and a drinks section. The prices are pretty reasonable considering the location. We enjoy the Breakfast Waffles with strawberries and whipped cream for $7.65. The Create Your Own Omelet is also a good choice for $9.10. It is freshly made while you wait. 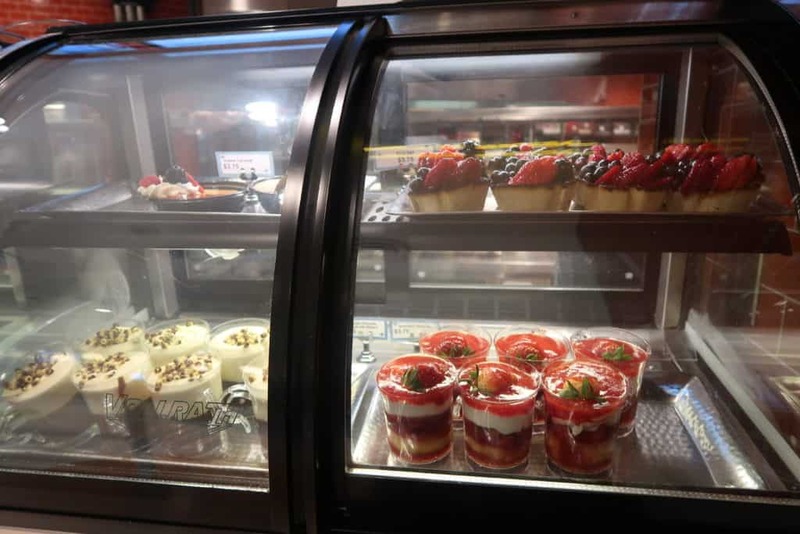 Lunch and Dinner at the Bayliner Diner also have some great choices. The Grill Station offers burgers, including a Black Bean Veggie Burger for $8.99. We like the International Station which serves some interesting choices such as Colombian Chicken Empanadas and Swedish Meatballs. 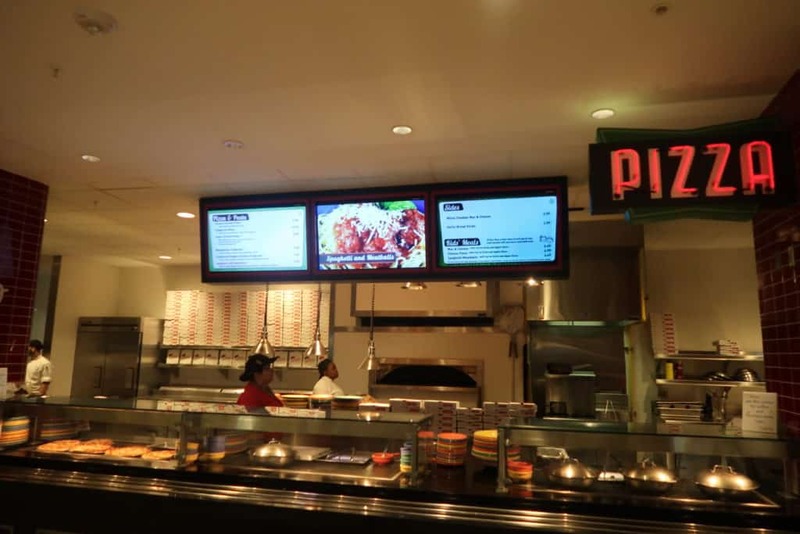 Pizza and Pasta is also available. The pizzas are particularly good. All of the hot food stations have a vegetarian choice. If you have a special dietary requirement just tell one of the staff. Bayliner Diner has a huge seating area. There are places for 600 inside and 100 outside. The whole theme is the retro 50s and 60s theme of the hotel. Lots of bright blue and orange furniture. Plenty of booths for you to sit and enjoy your food. You can watch old commercials on the huge screens in the seating area. Cabana Bay does not have a full service restaurant. However, there are plenty of places to dine just a short shuttle ride away. You can take the Cabana Bay Resort Shuttle to Universal Studios City Walk and there are plenty of restaurants to choose from. There is also a Universal Resort Hotel Shuttle which runs in the evening to take guests to Portofino, Hard Rock and Royal Pacific Hotel if you want to dine in one of the full service restaurants there. There are two outside bars at Cabana Bay – one in each pool area. 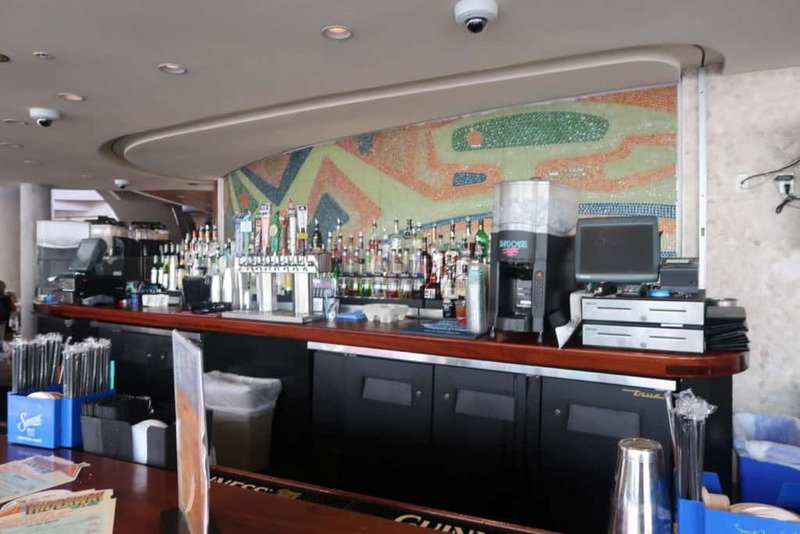 Our favorite is the Hideaway Bar and Gril which is open from 10 am until 10pm. It is right by the courtyard pool so convenient for the Cabana Bay Lazy River. The Atomic Tonic poolside bar is also a great place to enjoy a cocktail by the pool. The Sizzle Bar is located inside the lobby area and is open from 5pm until 11pm. There is a Happy Hour from 5pm until 6pm every day. Not many hotels have their own bowling alley! 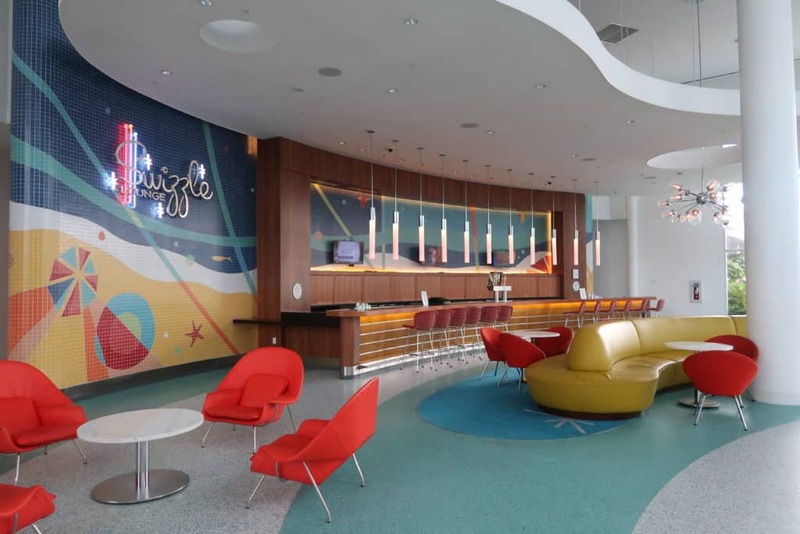 Staying with the retro theme, there is a bowling alley inside Cabana Bay Hotel. If you have ever seen the movie The Big Lebowski then you may recognize that the Galaxy Bowling alley is modeled on that. There are 10 lanes available for bowling from 11 am until 11 pm every day. The prices for Bowling are a little high, but it is a lot of fun. It is $15 for adults, $9 for kids 12 and under. The amount of time you get depends upon how many guests are in your party. Up to three people get one hour, four to eight people get 90 minutes bowling time. You can also grab a table and enjoy some traditional bowling alley type food. Items on the menu include Chicken Wings, Tater Tots and Steak Flatbread. There is also a bar offering cocktails, beer and wine. 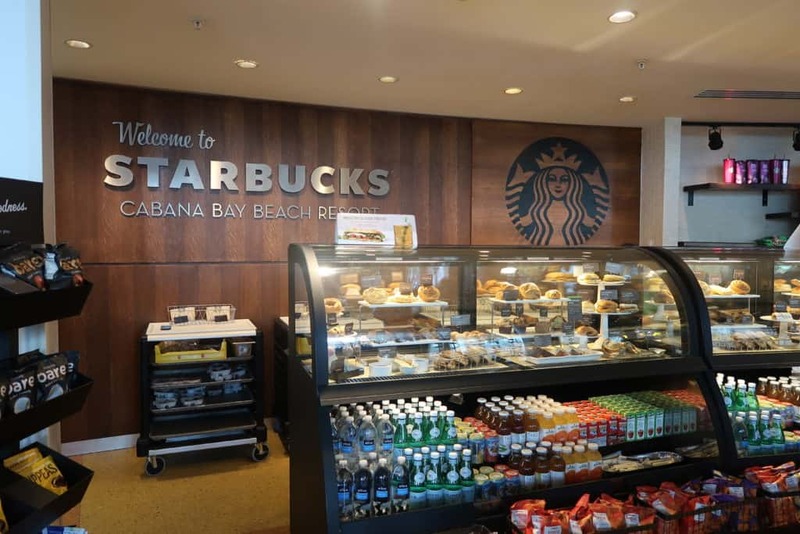 If you simply have to have your Starbucks fix every day then you will be well catered for at Cabana Bay. There is a large Starbucks right next to the Bayliner Diner. There is a large seating area. Lines can be long in the morning when everyone needs their first coffee of the day. We really like the Cabana Bay store which is located just off the hotel lobby. They have a good selection of items including a dedicated Harry Potter section. It is good to be able to browse without the crowds of people that you often find in the stores in the park. There are some fun Cabana Bay themed merchandise items available too. One of the really great things about staying at Universal Cabana Bay Beach Resort is that you do not need to have a car. If you just want to visit the Universal Parks then we would suggest you leave the car at home. There is a Hertz rental location available at all of the Universal Studios Resort Hotels, but if you are just visiting the Universal Parks you can walk or use the resort transportation. We found that the easiest way to get from Orlando International Airport MCO to Cabana Bay Beach Resort was to take an Uber. It was cheaper and easier than renting a car to get to the resort. If you do bring your car to Universal Cabana Bay Resort there is plentiful parking available. The day rate for Universal Cabana Bay Beach Parking is $12 for guests If you are not a guest of the resort the overnight rate of the hotel is $45 a night. Hint. Don’t do it. 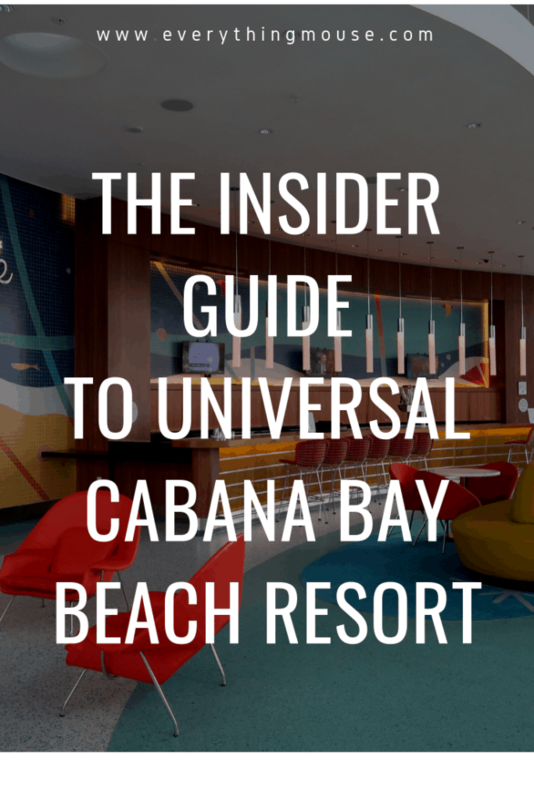 In summary we think that Universal’s Cabana Bay Beach Resort Hotel is one of the best hotel options if you are spending time at Universal Studios and Islands of Adventure. It’s combination of well designed rooms which are big enough for a family, location, fun theme and amenities is hard to beat.